A set consists of two wheels, an axle and crank pins where appropriate (available separately as Ref: 7802). We have a large range of wheels to fit most types of locomotives and the range is growing continuously. A wheel consists of a brass centre bush, nylon moulded wheel (so no problems with insulation) and a steel tyre. 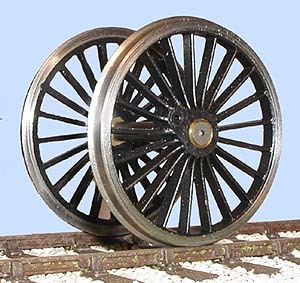 Standard driving wheels have square ended axles for easy quartering. Outside crank wheels have axles with a 'D' machined on to the extended axle to match up with our outside cranks (Ref:X720053E) for automatic quartering.